Bridges are a networking device that you need to understand before taking the compTIA A+ Certification Exams. Because all data passing through a repeater is regenerated and sent to all parts of the network, a great deal of network traffic is generated that affects the overall performance of the network. 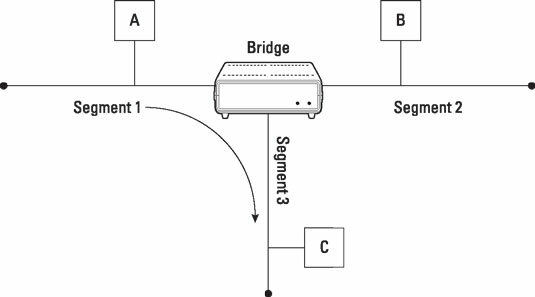 To prevent this buildup of network traffic, you can use a bridge (as shown), which is a device that connects network segments and also regenerates the signal (like a repeater). A bridge also filters the data so that it is sent only to the proper portion of the network, cutting down on network traffic and increasing overall performance. A bridge forwards network traffic to only the destination segment. The figure illustrates that when computer A sends information to computer C, the information travels along segment 1 and eventually reaches the bridge. The bridge looks at its bridging table (a list of MAC addresses and corresponding network segments that runs in memory) to see which network segment computer C exists on. In this example, it lives on segment 3. At this point, the bridge forwards the information only to segment 3, where computer C resides, and not to any other segment, thus filtering traffic and cutting down on network noise. Bridges increase performance on the network by filtering the network traffic, which gives the network and all its devices and applications more bandwidth to work with. The less network traffic, the less chance of collision and retransmission.